My photographer Chantal and I photographed this blog in the neighborhood that I grew up in. My house was across from the railroad tracks. I loved to watch the trains go by---there was something mesmerizing about it. And here I am, zillions of years later, using the train tracks as a back-drop for a photo-shoot. I didn't color coordinate this...it just happened! 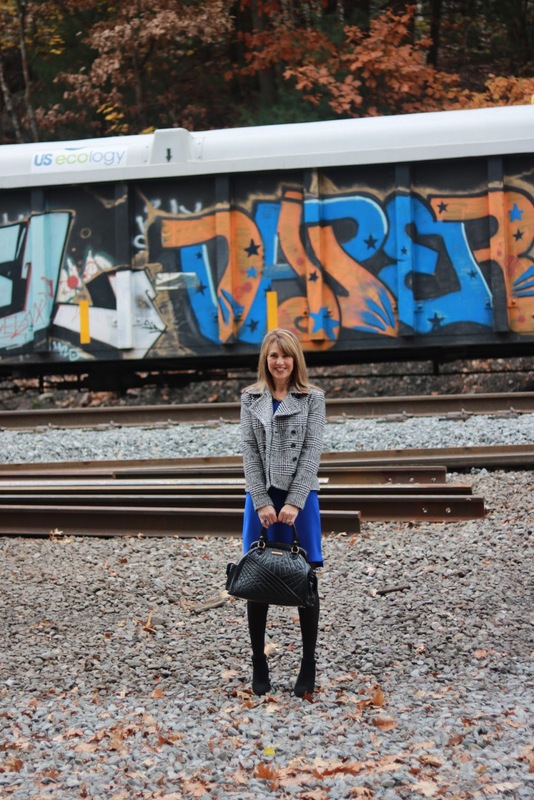 As a matter of fact, I showed up in this blue dress and there was the perfect boxcar in the background with pops of the same color! A simple sheath dress such as this one, is so versatile. You can make it look edgy, dressy, or even work appropriate (like this outfit). I paired this royal blue dress with a double breasted plaid jacket from Banana Republic. Here are other options for similar pieces..HERE, HERE and HERE. Next to the train tracks is a little walking path that is gorgeous in the fall. 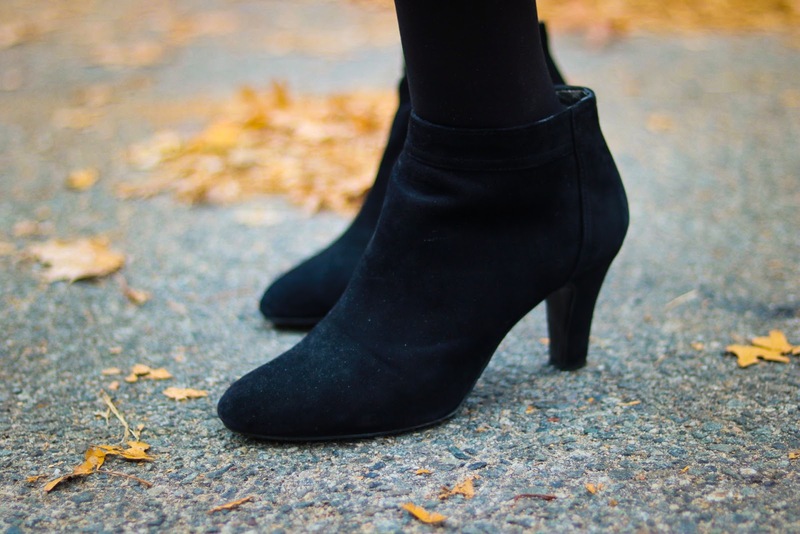 A black suede ankle boot is a wardrobe must-have, but I'm all about a mid-size heel that doesn't kill my feet. Here are some comfortable options--HERE, HERE and HERE. 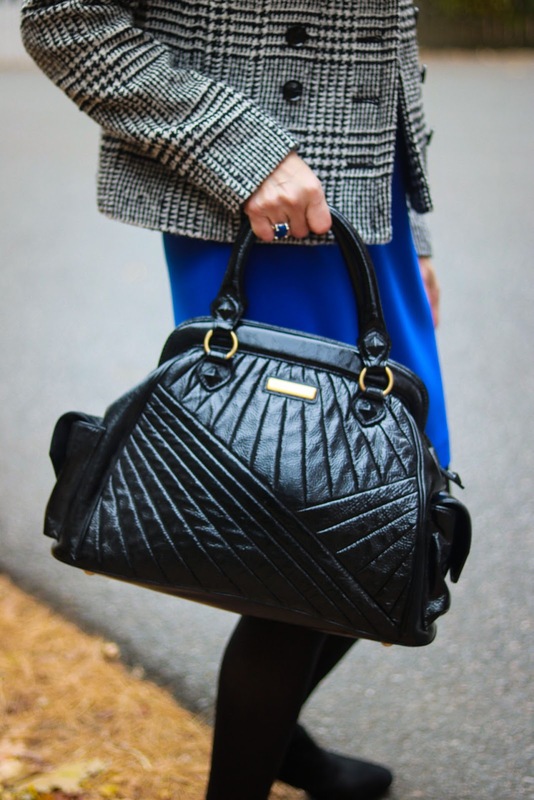 This black patent leather bag was a consignment find from years ago. I also love this patent leather tote, which just happens to be on sale! Off to visit my mom, she lives right around the corner. She's still in the same house I grew up in! Some links in this blog may generate a small commission. However, the content of my posts are based on my own honest opinions and are not in any way influenced by partnerships. What a beautiful place to grow up and what a fun photo shoot! Love that cobalt blue on you! I've always been envious of women who look fab in a sheath dress! You look wonderful! What a great color dress---I love wearing loads of color! And what a fun time taking pictures in your old hood! !